Note: This ARC was provided by Signal Boost Promotions in exchange for an honest review. This year, I discovered a new M/M author to fangirl over and after having read several of her ongoing series and one short story, I'm as hooked as ever on RJ Scott's books. 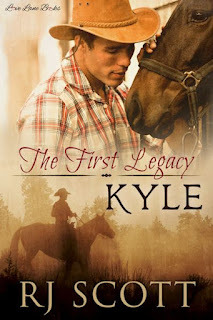 Her latest series, Legacy, is a spin-off of her Texas series, which I haven't had the pleasure of reading yet but will do so when my review schedule isn't as packed as it is now (and will continue to be until next month!). I do think that knowing the background of the Double D Ranch as well as the characters from there who also play significant supporting roles in this new series makes for a more well-rounded and well-informed reading experience. However, even without having read the Texas series, I was able to enjoy the Legacy series starter, becoming so invested in this story of two survivors who find a life worth living and a love worth living for. Twenty-seven-year-old Kyle Braden is still trying to fully wrap his mind around the idea of being a part of the Double D Ranch when he's entrusted with the responsibility of handling the building of the living quarters at the Legacy Ranch, a new endeavor spearheaded by Jack and Riley Campbell-Hayes. Kyle has issues he's dealing with. He's slow to trust, doesn't engage others in conversation, and keeps his distance from the others on the ranch. When twenty-two-year-old Jason Smith is taken in by Jack and Riley, he's put under Kyle's watch to help out with Legacy. Jason knows Kyle has a story tell, but it's clear that the man isn't forthcoming. They've both survived one form of abuse or another and now how it feels to be used. Can they learn how to trust those around them and trust one another and all their evolving feelings? This was such an intriguing story! Since I hadn't read the Texas series, I wasn't sure if Kyle was mentioned or played a minor part in any of the books, though I'm assuming he was in some form or another. His past still haunts him, stunting his ability to form any real relationships with the people of Double D Ranch. Jason pushes him out of his comfort zone, but Jason is also a broken man, one who doesn't just have a past to deal with but also struggles to get a hold on his depression. The hurdles they need to overcome are more of as individuals because in order for them to be a true couple, they'll have to face everything weighing upon them. They've got a strong support system around them, but they also need to be the ones to see and acknowledge that all these people want is to help the two without expecting anything in return. Learn more about RJ Scott. Purchase Kyle on Amazon | B&N | Kobo.